Immerse yourself in the dreamy atmosphere of Italy on this exclusive pre-set package that sweeps you away to the iconic cities of Rome and Florence, and also includes plenty of time to relax in luxury on the Cinque Terre coast. With exclusive pre-arranged tours with expert guides, accommodation and private transfers, this is the perfect Italy multi-resort tour on which to discover the heart of Italian culture and see iconic cities, while also having some time to relax in a coastal setting. Price: Starts from $2430 per person (land rate). Packages can be booked online with just a 20% deposit. Please refer to the Pricing box at the bottom of the page for more information on pricing and deposits. Departure date: Dates are flexible and customizable for private departures, allowing you to select your preferred departure date. Flights: Please note that this package does not include flights. When purchasing your flights from your chosen airline, we recommend that you fly into Rome Fiumicino Airport and fly out of Pisa International Airport. If this is not possible for you but you would still like to book this package, please contact us for a customized quote. Itinerary: The first stop on this Italy multi-resort tour is the Eternal City of Rome, where you will visit the famous Vatican Museums and be enchanted by the grandeur of the Sistine Chapel. 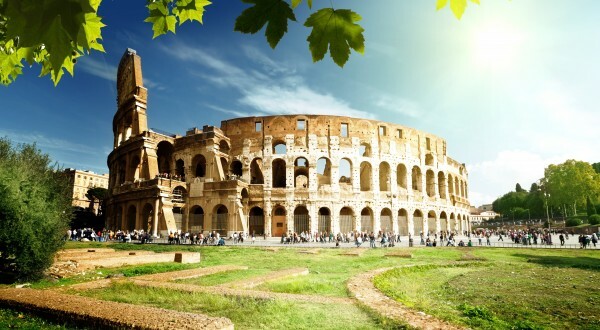 We will also treat you to a tour of Rome’s underground catacombs, as well as a special-access tour of the Colosseum so that you can enjoy all the main sights of this magical city before we whisk you to the Cinque Terre for 3 nights of relaxation. This rugged stretch of the Italian Riviera is a place where you can completely relax and reconnect with nature and, as a part of this Italy multi-resort tour, we will arrange a sun-kissed walking tour so that you can explore the best sights with a knowledgeable guide. The finale of this Italy multi-resort tour is Florence – a place where you can immerse yourself in the Renaissance and see sublime architecture. As a special treat, we will arrange a special viewing of Michelangelo’s famous sculpture of The David, and we will also help you create magical memories of your Italy vacation with a tour of Tuscany and the Chianti wine region. You can book this package safely and securely online using the box at the top of the page. Simply select the number of travelers, the star of accommodation you would like and your chosen vacation dates, and click “Book now”. You can also select to pay the full balance or just a deposit. Alternatively, please contact an expert member of our travel team to book this Italy packaged tour: call (US) 347-594-5500 or click here to send an online inquiry. If you like this packaged tour but would like to modify the itinerary to suit your requirements, that is not a problem at all as we specialize in tailor-made travel to Italy. Simply contact a member of our expert team with your wishes and we will create a custom tour to suit your needs and budget: call (US) 347-594-5500 or click here to send an online inquiry. Day 1: Welcome to Italy! This glorious Italy multi-resort tour begins in the Eternal City of Rome – a place where you can walk through years of history and discover a culture that is vibrant and encapsulating. You will experience luxury as soon as you arrive in Rome with a private transfer from Rome Fiumicino Airport to your hotel in the heart of the city. After plenty of time to relax at your hotel or enjoy Rome at your leisure, today we will treat you to a tour of Rome’s most iconic sight: the magnificent Colosseum. Our private guide will meet you at your hotel (or designated meeting point) and take you on a journey back in time to the Fori Imperiali, Roman Forum and Augustus Domus. The finale of this private tour takes you to the glorious Colosseum, where you will enjoy a two-hour in-depth guided visit that includes special access to the upper tier and fascinating underground level. 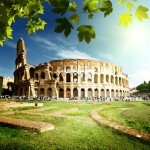 This is the most complete tour of the Colosseum and a chance to learn the secret stories of this iconic landmark. Join our expert tour guide on a wonderful journey to the world’s smallest sovereign state and one of the most important stretches of land in the Catholic religion as you cross the border into Vatican City. You will start your adventure at the door of St Peter’s Basilica, one of the largest religious buildings in the world and a crowning example of Renaissance architecture, where, once inside, you can discover spectacular art from Michelangelo and Bernini. After enjoying the delights of St Peter’s, you’ll enter the Vatican Museums, which are filled with rare artefacts and priceless masterpieces, including ancient Greek statues and Renaissance frescoes that are simply waiting for you to discover them. At this point, you may feel that the Vatican couldn’t get any more glorious, but we have saved a grand finale! On the last part of this Vatican City tour, as you cast your gaze to the heavens, you will witness the unmatched genius of Michelangelo in the sensational Sistine Chapel. This is a building unlike anything else on Earth, so be sure to take some time to savor it as your detailed tour of the Vatican comes to an unforgettable end. After plenty of time to immerse yourself in the enchanting delights of Vatican City and free time for lunch, we will show you another face of Rome with a tour of the underground catacombs. As a part of this private guided visit, you will see San Clemente Basilica with its underground crypt and the Vicus Caprarius water city. This is a unique experience that allows you to discover more about Christian Rome and connect deeply with your faith. With plenty of time to explore the fascinating attractions in Rome, this Italy multi-resort tour continues with 3 nights of relaxation on the stunning Cinque Terre. This charming stretch of coastline in Liguria is known for its fishing villages: Monterosso al Mare, Vernazza, Corniglia, Manarola and Riomaggiore. The coastline, the five villages and the surrounding hillsides are all part of the Cinque Terre National Park, which is characterized by its beautiful landscape. Here, you can recline amongst the scent of Mediterranean flowers as you look out on sparkling waters and absorb the Cinque Terre’s laid-back lifestyle. On your first full day on the Cinque Terre, you will have the chance to explore this stretch of coast with an expert guide. 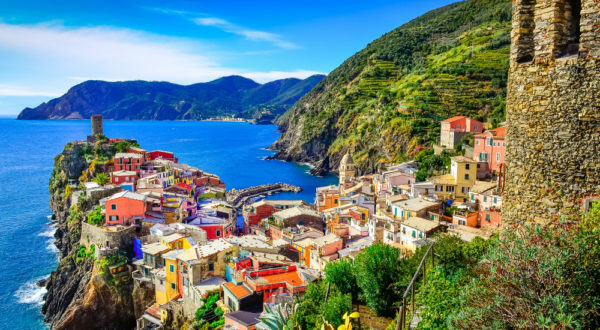 As a part of the experience, you will stroll among vineyards as you explore centuries-old settlements, including Riomaggiore, Groppo, Manarola and Vernazza. During the three-hour walking tour, your guide will tell you stories about village life and explain the region’s vibrant wine culture. Top Cinque Terre attractions that you will enjoy include Via dell’Amore and the 14th-century church of Our Lady of Health in Volastra. There will also be plenty of time to enjoy panoramic views of the Italian coastline and the blue waters of the Ligurian Sea. This will be a full day for you to explore the Cinque Terre at leisure. Feeling rejuvenated from your time relaxing on the Cinque Terre, this Italy multi-resort tour ends in the Renaissance city of Florence. Upon arrival, you will have time to settle in at your centrally located hotel before we treat you to a private walking tour of the Accademia Gallery. Here, you’ll find the glorious and imposing sculpture of “David” by Michelangelo, which is a symbol of the power and invincibility of the Florentine Republic. It is one of the world’s most famous sculptures and we are sure it will stun you into silence with its magnificence. This will be a full day for you to explore Florence at leisure. This unforgettable group excursion gives you the chance to discover Tuscany’s hidden treasures. It starts with a trip to the Medieval hilltop town of Monteriggioni, which is surrounded by ancient city walls and gives you a glimpse back in time with its historic architecture and quaint city streets. The tour then continues with a guided visit to Siena, which is famous for its Gothic architecture and the annual Palio horse race, which takes place in the city’s historic main square. Here you can enjoy attractions, such as Piazza del Campo, Palazzo Pubblico, Torre del Mangia and the pretty Cathedral, before continuing with the tour to San Gimignano, which is well-regarded for its local wine called Vernaccia. It’s a UNESCO World Heritage Site and here you will have free time to stroll the narrow streets and admire the landscape, or perhaps sample ice-cream from one of the town’s award-winning “gelaterias”. As a grand finale to the tour you will then journey into the Chianti region and to a rustic wine estate set amongst green fields and vineyards, where you can sample local wine and home-made snacks. The morning sees you leaving Italy on your flight from Pisa International Airport back home. The sights, sounds, tastes and experiences of the past days will no doubt flood over you as you enjoy the luxury of a private transfer to the airport, leading you to smile in remembrance of times past and to plan for your inevitable return visit! How to book: You can book this package safely and securely online using the box at the top of the page. Simply select the number of travelers, the star of accommodation you would like and your chosen vacation dates, and click “Book now”. You can also select to pay the full balance or just a deposit. Alternatively, if you would like to find out more about this Italy multi-resort tour, please call our friendly team members at (347)-594-5500 or click here to send us an inquiry. Please note that the Vatican Museums in Rome are closed on Sundays and religious holidays, and the art galleries in Florence are closed on Mondays. In the case of unavailability, alternate itinerary options will be offered. Our prices are seasonal. The low season runs from November 1st until March 31st, and the high season runs from April 1st until October 31st. Please see below for a breakdown of the package prices. This pre-set package can be booked with just a 20% deposit. If you choose to book online with a deposit, please note that the remaining balance will be due 70 days prior to your vacation departure date. Your booking confirmation email will contain details on how to complete your booking and how to pay your remaining balance online through our secure facility. Please note that if your vacation departure date is less than 70 days from the date of booking, the deposit option is unavailable and you will be required to pay the full balance to confirm your booking.